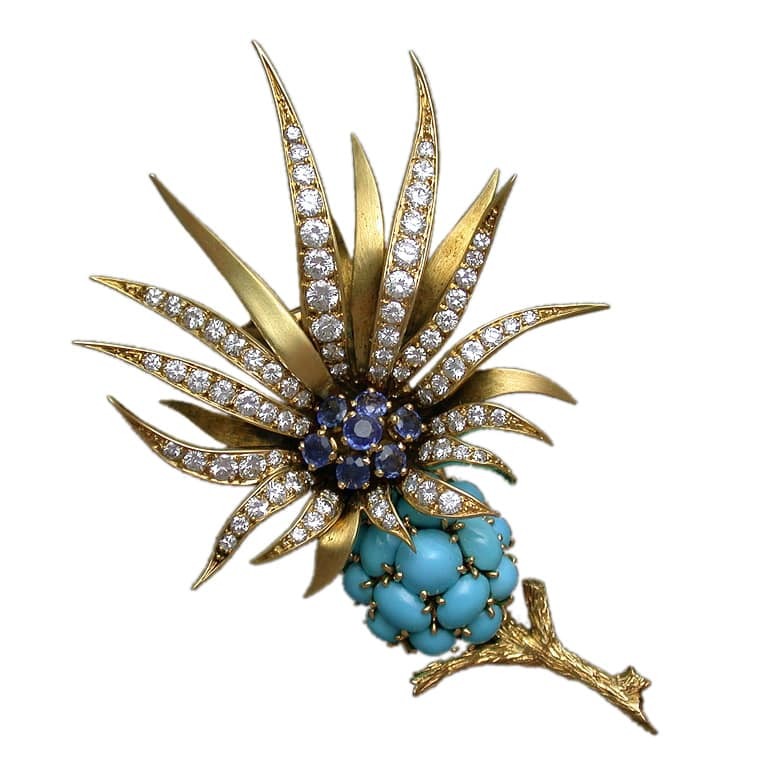 Sterle Sapphire, Diamond, Turquoise and Gold Floral Brooch. French jeweller famous for his 1940’s and 1950’s designs. In 1934, Pierre Sterlé opened a workshop on Rue St-Anne. Some of Paris’s finest jewellers patronized him, including Boucheron, Chaumet, Ostertag. In 1939, having established a loyal following, Sterlé began to produce pieces exclusively for individuals. In 1945, he moved to 43 Avenue de l’Opera near the Place Vendôme. Like the jewellers at Boivin before him, and JAR after him, Sterlé thought of himself as a highly exclusive designer and refused to occupy a ground-level location where he would have to display his jewels in window cases, open to public view. His pieces were thus produced for, and seen by, a select few. If jewellery historians are to be believed, his clients and fellow jewellers considered him “a revolutionary figure” because of his work’s originality and his technical expertise.1 His favorite motifs included birds, wings, feathers, animals, and flowers. His designs were executed in a baroque, asymmetrical style and were typically embellished with a combination of precious and semi-precious gemstones. Some of them also featured “angel wire,” a mesh of sorts, which he created in 1957.2 During the 1960’s, he sold his business to Chaumet. In the 1970’s, he created “Oriental-style” jewellery for the firm. Gold & diamond studded leather goods. Wife of Maharaja of Baroda. Becomes a member of the DeBeers Diamond Corporation. Financial and personal problems required him to sell of many possessions. The majority of his work sells through Chaumet. Bankruptcy and stock liquidation (mostly to Chaumet). Sterlé becomes a Technical Consultant to Chaumet. Raulet, Sylvie, Jewelry of the 1940’s & 1950’s. New York: Rizzoli, 1988. Traina, John. Extraordinary Jewels. New York: Double Day, 1994.